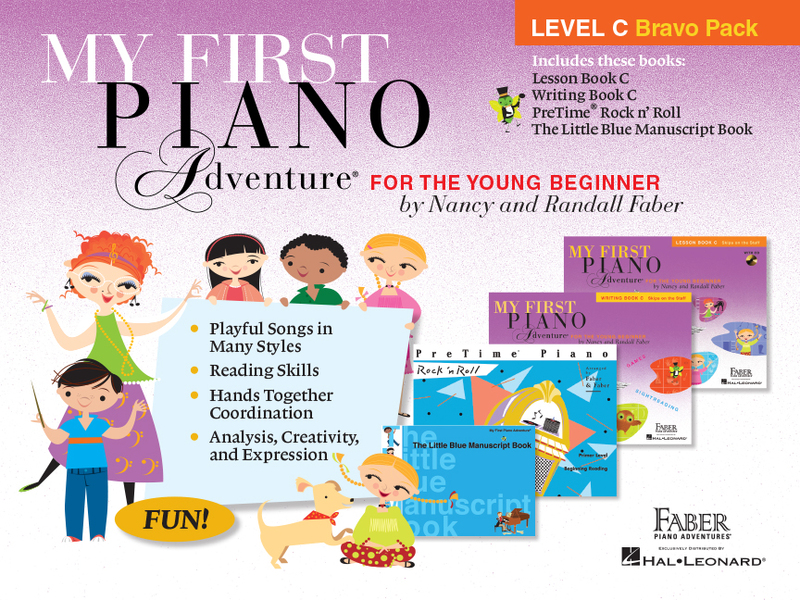 Written for ages 5 and 6, My First Piano Adventure captures the child’s playful spirit. Fun‐filled songs, rhythm games and technique activities develop beginning keyboard skills. My First Piano Adventure Lesson Book C with CD continues the staff‐reading adventure with the introduction of skips (3rds). Students first explore skips aurally and kinesthetically across the full range of the keyboard. A delightful variety of songs guide the child toward line‐to‐line and space‐to‐space staff recognition. 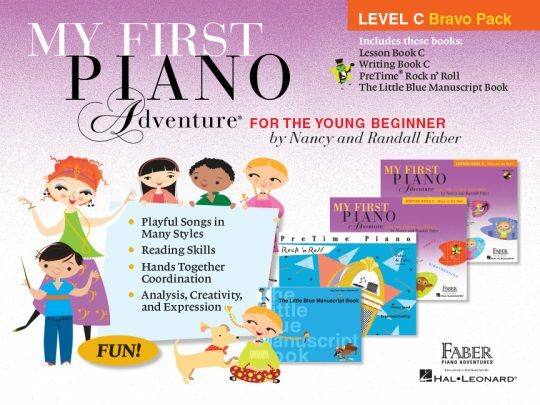 My First Piano Adventure Writing Book C contains fun‐filled pages of writing, ear‐training, and “CLAP for Sightreading” activities. A focus on reading skips leads students on many learning adventures! Children are engaged in the lives and melodies of classical composers such as Haydn, Mozart, Beethoven and Tchaikovsky. PreTime® Piano Rock n’ Roll is a motivating set of original rock and roll tunes especially written for children. Teacher duets provide an energetic sound and give the student a strong rhythmic experience. The Little Blue Manuscript Book is the perfect writing companion for students in My First Piano Adventure. Large‐sized staffs provide plenty of room for writing assignments and exploring composition. An eight‐page reference section covers note values, musical terms, staff orientation, clef drawing, and a simple introduction to composing with patterns. Bonus teaching tips are included, with detailed assignment ideas for use in the lesson or at‐home writing. Get a complete curriculum in one convenient bundle and save 20% off single book prices when you purchase the Bravo Pack.